Similar to my Kengadget Selfie Stick review, there is very little information available about TechSavvy. However, feel free to check out their website here . This website was pretty basic, only having an about us, warranty, and product page. Honestly, there was no point of the website except for the warranty page. 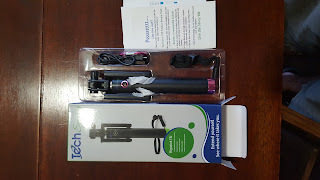 Finally, the Selfie Stick cost $24.95 on the TechSavvy page, but can be found for $9.99 . The contents I received: a pink accented selfie stick, USB charging cable, lanyard, instructions, and a small carabiner. New Pink Selfie Stick and all its accessories. The whole point of the selfie stick is to take pictures of yourself and friends with ease; however, I find it increasingly hard to get people to take selfies with me. There seems to be a negative vibe about using a selfie stick in public. 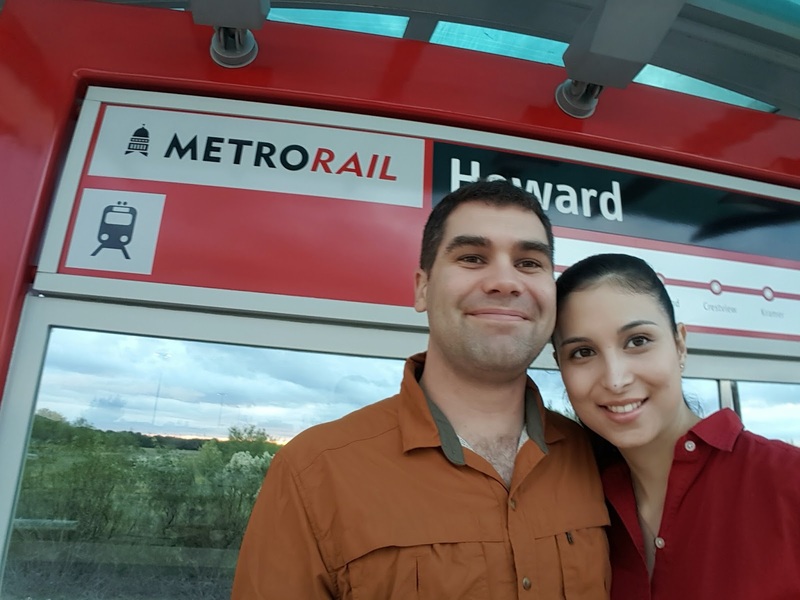 Selfie sticks are designed to be lightweight, extendable poles that allow the user to take a picture from up to 32-inches away. This is done with a push of the button at the base of the pole once the stick is synched with a phone using Bluetooth. I have been using the TechSavvy for just short of a month now. 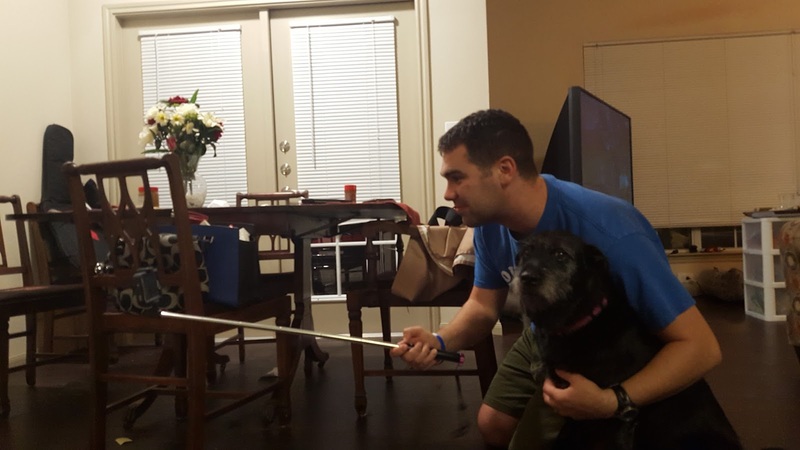 I had plans to use it on a few mountain bike rides, but it’s been a rainy weekend since receiving the selfie stick. Instead, I took it to downtown Austin on a 2-mile ghost tour. The stick was able to survive being shoved into my pocket and bumps from various costume wearing partiers. Additionally, there was a light rain at one point during the night and it had no effect on the sticks survivability. If the stick had been destroyed, TechSavvy fortunately offers a lifetime warranty on its products. This selfie stick once again made taking photos a lot easier as I was able to take quick pictures easily with a button click. Moreover, the phone holder easily accommodates my Galaxy 6 and huge Mophie phone case. I would guess that Galaxy Notes would fit as well (I haven’t tested this). I also found this stick quicker and easier to use than the Kengadget stick. Finally, the picture button is a blue LED, so it is insanely easy to find, even in the dark. Finally, the instruction booklet made figuring out how everything works a breeze. It required no guesswork. After using this selfie stick, I only found 2 real issues: the telescoping pole spins and it’s impossible to fully tighten the screw for the phone holder. The pole will spin a little in relation to the plastic handle. I’ve never had a problem with the pole spinning, but with a heavy enough phone and over enough time, I can see how it would get easier to spin. Secondly, the screw that locks the phone holder into your favorite angle cannot be hand tightened to the point of fixing the phone’s position. Instead, the phone holder is still adjustable by hand, even at maximum tightening. The last possible issue, which was fine with me, is the TechSavvy stick is only 32-inches. This is much shorter than most sticks, which are usually 40+ inches. I now own 2 selfie sticks and the TechSavvy Selfie Stick is now my go to stick for all my adventures. It has a better price and is just better overall quality. Are you using a selfie stick or are you too embarrassed? I’d love to know your thoughts. Also, Make sure to keep up to date on all our adventures by following us on Facebook. This was a sponsored product review. One TechSavvy Selfie Stick TSi was provided by TechSavvy for review. Maybe the embarrassment is more of a generational thing. I assume younger people are more ok with selfies. Oh, and BeeGee was looking away from your camera, so she might not like selfies either. BeeGee always looks away when taking pictures. I am pretty sure she is camera shy. Any thing new in the works? I finally got around to publishing a post just now! Also, stay tuned for a post by Linda and Jack's Texas Triple Threat trip review.